Fundamental work on RNA is intended to help assist with probing life's origins. All life on Earth uses DNA to encode and store genes, and to pass them on from one generation to the next. RNA, a close molecular relative of DNA, is used within living cells to carry out a wide variety of important biological functions, including protein synthesis. DNA and RNA are both extremely complex molecules, a fact that has fueled a long-standing debate about the origins of life. RNA looks potentially older and more versatile than DNA, so many scientists believe that RNA came before DNA. But did life begin with RNA, or was there something even simpler that preceded it? "The origin of RNA is something I've been working on for two decades," said Nicholas Hud, head of the Georgia Institute of Technology's Center for Chemical Evolution, where researchers are attempting to figure out how life began. "It is easy to speculate that some other molecule came before RNA, but determining the structure of molecules that might actually have come before RNA is a major challenge for chemists." "Proflavine can cause the formation of a duplex from two nucleic acids that otherwise do not form duplexes at all," Hud said. He added that their results are important for two reasons. The first is that duplexes formed by DNA and an unnatural nucleic acid could be used to create dynamic structures that assemble only when proflavine, or a similar molecule, is present. This property has potential applications in nanotechnology, or the technology of very small things. "There have been many proposals for possible pre-RNA structures," he said. "While it may not be possible to determine the exact structure of any of the molecules that served as the ancestors of RNA, researchers generally agree that the ability to form a duplex with RNA is an important criterion that must be met for a molecule to be considered a possible ancestor of RNA." Back in 2000 Hud and his collaborator Frank Anet proposed that small molecules might have helped the synthesis of RNA, or the original ancestor of RNA, if RNA came later. They called these hypothetical small molecules "molecular midwives," to reflect that these molecules would have helped give birth to RNA. They proposed that molecular midwives would have been similar to molecules that are currently known to bind DNA and RNA, such as fluorescent dye molecule known as "intercalators" that are used to visualize DNA in the laboratory. Most recently, Hud and his collaborators have discovered that proflavine, a particular intercalator, is able to cause the formation of a double helix, like that formed by two DNA molecules, but between RNA and a non-natural RNA-like molecule that has a "backbone" structure distinct from RNA and DNA. In the absence of proflavine these molecules do not form double helixes. 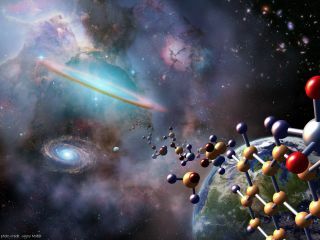 This result has important implications regarding the origin of the first RNA-like molecules of life. In particular, the number of molecules that could have served as the first genetic molecules of life might have been much greater than previously expected if intercalator molecules we present on the early Earth. Hud notes that proflavine is not a potentially prebiotic molecule, but was used in their study as a model for the type of intercalator molecules that may have been available on early Earth. Scientists have also found evidence of asteroids bringing the building blocks of life, such as amino acids, to Earth. Hud has spent years studying the potential role of intercalators in the origin of RNA. Very few studies have investigated the ability of intercalators to bind non-natural RNA-like molecules, and no previous studies had investigated the possibility that intercalators might allow RNA to pair with polymers that would otherwise be "incompatible" with RNA. "In our earlier work on iso-GNA revealed that this molecule did not form duplexes that are stable as those of DNA or RNA," Krishnamurthy said. "We proposed that this limitation of iso-GNA could be overcome by the use of intercalators since they are known to stabilize base-pairing within a duplex structure by enhancing base-stacking. What is fascinating in this study is that the increase we observed for the stability of iso-GNA duplexes in the presence of proflavine is much larger than the increased stability those observed when proflavine binds DNA or RNA, far exceeding our expectations. This study should allow for a greater flexibility when searching for possible prebiotic polymers that are able to interact with RNA (or DNA)." These latest results have caused Hud and Krishnamurthy to broaden their view of which molecules might have come before RNA. These two researchers and their co-workers are currently trying to find a possible ancestor of RNA that is able to spontaneously form from molecules that were present on the early Earth. They remain more open than ever to the idea that some molecules not seen in life today may have been necessary to get life started, perhaps molecules that we could view as the "midwives" that helped give "birth" to RNA. Funding for the research was provided by the National Science Foundation (which funds CCE more generally) and a grant from the NASA Astrobiology Institute element of the Astrobiology Program at NASA.